You have gone and picked out your newest member of your family, congratulations! Now your puppy or mature dog will need some essentials before you pick them up for your journey home. The basics of bringing home a loyal four-legged friend: collar, leash and food bowl. No, I have not forgotten dog food either. That topic alone could have its own series of articles. 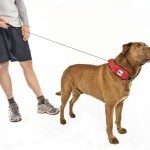 As a dog owner, I would like to encourage anyone who has a small to medium sized breed to consider a harness in place of or in addition to a collar. 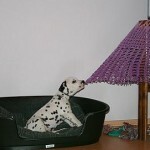 There are a number of dog breeds that a collar is sufficient to hold them securely. Then there are some dogs that can slip a collar on occasion when they get excited and start wiggling around. For these dogs, I recommend a harness arrangement. My wife and I have found that our Beagles have adapted well to the harness. We have used the Hamilton brand of adjustable nylon harnesses for years now. Basically they’re easily adjustable and comfortable for the dog to wear for long periods of time. The harness has a metal ring to clip the leash to at the rear of the assembly, roughly above the shoulders or middle of the dog’s back. 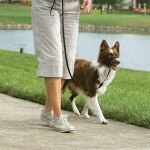 This in my opinion offers better control of the dog’s movements when they get energetic. It means you are not putting stress or pulling hard on the dog’s neck and airway. The point of control around the middle mass of your dog also means you have to put less energy into holding your dog back if they get excited. There is more material to catch hold of if your dog likes to try to slip out the door when it opens. As with any product, harnesses can loosen or wear with time. If you have a very active dog, check every few months that whatever you use is in good repair. Both of our Beagles weight has changed over the years. My wife has taken great care to help her little guy slim down to a healthy weight for his age. Rocky is now 12 years old as of August 2014 and is in great shape for his age. We bought him a new harness when his last one started to show its age. Our other little Beagle Daisey is nothing short of a Houdini when it comes to escaping and having a good time playing with us as we attempt to get her back. Her physical size puts her just on the verge of a small and medium harness. She often comes with the harness slipped around her shoulder. We joke that she is doing her fashion statement: it reminds us of back in the 80’s when women would wear their tops with their shoulder showing. Yet the Hamilton Adjustable Harness still keeps her secure where she may have slipped a conventional collar completely. I would like to close this article by identifying that what I have shared is from our own personal experience only. Neither my wife nor myself are a professional dog trainer. 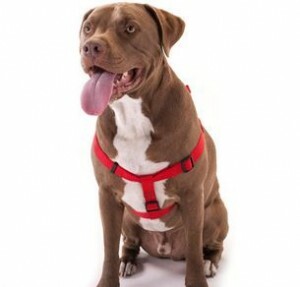 These harnesses are only a suggestion to help you with your dogs and their safety. You may find a different product works better for your particular dog or breed. If you are interested in finding out more, visit your local pet store or vet. The brand talked about is labeled, Hamilton Adjustable Harness. Depending on the size of your furry friend, they can range in price from $16 to $30. The price may vary depending on where you order. Illustrator, Comic Book Creator, and Pet Owner. 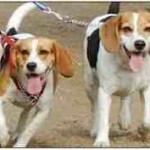 My wife Catherine and I have two Beagles and two Kitties.We live in Ontario Canada and want to help people put good things out into the world. «Dogs and Ear Infections- Is your dog always digging at those ears?